We’re going to credit back any arcade points used in your arcade through the end of the year. *Limited time offer for Viveport Arcade subscribers only between 12:00 am PT November 12, 2018 and 11:59 PM PT December 31, 2018.
Credit will be applied to your account by the 10th of December for any credits earned in November and the 10th of January for any credits earned in December. Monthly fees will be credited to your account as points with equivalent value. Credit will be delivered via a redemption code sent to the email address associated with your Viveport Arcade account. Not valid on any prior orders or purchases; cannot be transferred or otherwise redeemed for cash or other promo code(s). May not be combined with other offers. Void where prohibited or restricted by law. HTC reserves the right to modify or discontinue this offer at any time. Limit one credit per subscription account. Other exclusions or limits may apply. Viveport Arcade is HTC VIVE’s proprietary content management and distribution platform for VR developers and operators who want to introduce out-of-home VR experiences. It enables operators around the world running venues such as arcades, Internet cafes, movie theaters and shopping malls to legally acquire VR content and offer it to the public for a fee. The Viveport Arcade platform is an end-to- end software solution that provides both a front-end consumer interface and a backend that accurately tracks usage data, manages sales and offers a secure billing solution for developers and operators. The Viveport Arcade platform was launched in Public Beta on September 21, 2017 after a trial period with invited operators. I am an operator. How can I learn more about the program? An operator interested in the Viveport Arcade content management and distribution system may visit our webpage with the most updated information at https://arcade.viveport.com/. Who can I contact about Viveport Arcade business inquiries and questions? Who can I contact to receive Viveport Arcade Technical Support? Advantage and Advantage+ for VIVE Enterprise has you covered by offering two tiers of commercial licensing, dedicated support, and service utilities for VIVE Pro. Each program offers purchase protection with tailored hardware warranties, limited down time, dedicated support and advanced device management utilities. The Viveport Arcade program is an end-to-end platform solution for many commercial operators looking to have an efficient software solution that is both an operating system and one stop for DRM and a legally acquired content library. The Viveport Arcade team works directly with developers to secure their titles for location-based initiatives; therefore, operators can access multiple apps from one source rather than spend time independently negotiating with individual VR developers and managing reporting and payments. Operators who implement the service also receive access to a custom toolkit with approved logos, brand guidelines and co-marketing templates for in-store and digital promotion. We provide flexible pricing options for operators. We currently accept most major credit cards for global operators. Within China, we accept Wechat Pay and Alipay. We also accept wire transfer for volume purchases. We also accept wire transfer for volume purchases. Operators will have access to an evolving portfolio of VR games and experiences secured by HTC for public distribution. The availability of content may vary depending on territory and rights. Operators may select à la carte or from recommended lists curated by HTC. Prices are determined by the content developer/publisher and not by Vive. For Operators who have previously installed VIVEPORT Desktop on the Station PC, you will need to uninstall VIVEPORT Desktop before installing VIVEPORT Arcade. Vice versa, once VIVEPORT Arcade is installed you will be unable to install VIVEPORT Desktop. VIVEPORT Arcade & VIVEPORT Desktop are, by design, incompatible. VIVEPORT Desktop is for home use only. Businesses should use VIVEPORT Arcade Manager. Viveport Arcade is meant as efficient solution for both operators and developers to mitigate having to independently negotiate hundreds of deals and to establish a transparent payment and reporting system for both sides. If in certain cases there are preexisting arrangements between operator and developer, we respect those partnerships, and an operator may simply choose not to select that specific title from the Viveport Arcade portfolio if also available. No, content licensed via Viveport Arcade can only be accessed via the Viveport Arcade Manager. I’ve heard of VIVELANDTM. What is that? Are you franchising? VivelandTMis HTC’s showcase in Taipei for a dedicated VR amusement center. This is a limited showroom at this time and franchising is not currently available. Together with the Business Edition hardware, the Viveport Arcade program is HTC’s turnkey solution for third-party venues looking to provide VR experiences to the public. I have additional questions about Viveport Arcade Manger, who can I contact? You can contact va.na@viveport.com or va.emea@viveport.com. 1. If a Viveport title is compatible, you’ll see the Oculus logo in the detail area. 2. To find all compatible titles, use the Oculus Rift filter in All Games, under Supported Headset. 1. 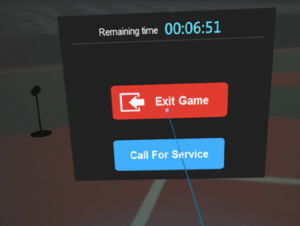 While in VR, click on the Menu button, then click Exit Game. 2. Alternatively, press the Oculus Home button, then click on Exit to Home. Please wait a few seconds to return to the Arcade main menu. 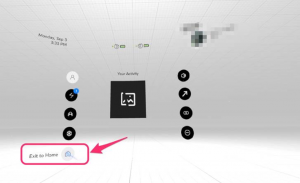 Please note: while in the Arcade main menu (or virtual lobby), please avoid pushing the Oculus Home button. This will trigger the restart of the launcher.